A gas spring is made up of a steel cylinder filled with nitrogen gas under high pressure; a small amount of oil, a piston, piston rod, seal and end fittings. 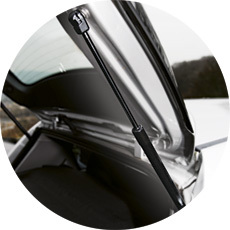 The function of an automotive gas spring is to support the opening and closing of the vehicle's boot or bonnet. This aids the elevation, holds the weight once open & allows for a controlled close. The piston inside the gas spring is designed in a special way such that the upper side has a larger surface area than the underside, causing the gas pressure to force the piston and rod out to maximum stroke. In use, there is a load forcing the piston inside the cylinder. Once this is released, for example when a boot latch is opened, the force is overcome by the nitrogen pressure on the upper side of the piston leading to extension of the spring. The piston areas and gas pressure are specifically designed for each application depending on the weight of the vehicle's tailgate, for example, to give the required spring load and deflection performance. The speed is controlled by the piston channel size; and the speed reduction near to maximum opening is assisted by the use of a small amount of oil in the cylinder to give a damping characteristic towards full extension. All new gas spring products are endurance tested for life time assurance.